On consignment from the artist to (Kraushaar Galleries, New York), by 1937; purchased April 1937 by the Corcoran Gallery of Art, Washington; acquired 2014 by the National Gallery of Art. Possibly An Exhibition of Paintings by Arthur B. Davies, William J. Glackens, Robert Henri, Ernest LAwson, George B. Luks, Maurice B. Prendergast, Everett Shinn, and John Sloan, Philadelphia Academy of Fine Arts, Philadelphia, 1908. no. 53. Possibly Newark Public Library, New Jersey, 1909, no. 7. Probably C.W. Kraushaar Art Galleries, New York, 1935, no. 27. Fifteenth Biennial Exhibition of Contemporary American Oil Paintings, Corcoran Gallery of Art, Washington, 1937, no. 367. William Glackens Memorial Exhibition, Whitney Museum of American Art, New York, 1938-1939, no. 7. Memorial Exhibition of Works by William J. Glackens, Department of Fine Arts, Carnegie Institute, 1939, no. 44. Memorial Exhibition: Paintings and Drawings by William J. Glackens, Corcoran Gallery of Art, Washington, 1940, no catalogue. Artists of the Philadelphia Press: William Glackens, George Luks, Everett Shinn, John Sloan, Philadelphia Museum of Art, 1945, no. 2, repro. Exhibition of 200 Years of American Painting, Tate Gallery, London, 1946, unpublished checklist. American Painting: Second Quarter of the 20th Century, Jacksonville Art Museum, Florida, 1956, no. 4. Past and Present: 250 Years of American Art, Corcoran Gallery of Art, Washington, 1966, unpublished checklist. Williams Glackens in Retrospect, City Art Museum, Saint Louis; National Collection of Fine Arts, Washington; Whitney Museum of American Art, New York, 1966-1967, no. 21, as In the Luxembourg Gardens. Corcoran [The American Genius], Corcoran Gallery of Art, Washington, 1976, unnumbered catalogue. The William A. Clark Collection, Corcoran Gallery of Art, Washington, 26 April - 16 July 1978, unnumbered catalogue. Guy Pène du Bois: Artist About Town, Corcoran Gallery of Art; Joslyn Art Museum, Omaha; Mary and Leigh Block Gallery, Northwestern University, Evanston, 1980-1981, no. 95. Henri's Circle, Corcoran Gallery of Art, Washington, 20 April - 16 June 1985, unnumbered checklist. Artistic Transitions: From the Academy to Impressionism in American Art, Cummer Gallery of Art, Jacksonville, Florida, 1986-1987, no. 19, as In the Luxembourg Gardens. The Century Club Collection, Corcoran Gallery of Art, Washington, unpublished checklist. The Impressionist Tradition in America, Corcoran Gallery of Art, Washington, 2003-2004, unpublished checklist. Encouraging American Genius: Master Paintings from the Corcoran Gallery of Art, Corcoran Gallery of Art, Washington; Museum of Fine Arts, Houston; Parrish Art Museum, Southampton; Mint Museum of Art, Charlotte; John and Mable Ringling Museum of Art, Sarasota, 2005-2007, checklist no. 62. American Paintings from the Collection, Corcoran Gallery of Art, Washington, 6 June - 18 October 2009, unpublished checklist. William Glackens, Museum of Art, Southeastern University, Fort Lauderdale; Parrish Art Museum, Water Mill, New York; Barnes Foundation, Philadelphia, 2014-2015. Corcoran Gallery of Art. Handbook of the American Paintings in the Collection of the Corcoran Gallery of Art. Washington, 1947: 75. Corcoran Gallery of Art. Masterpieces of the Corcoran Gallery of Art. Washington, 1959: 61, repro. Roeder, Katherine. 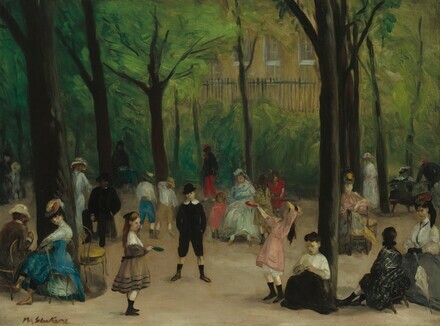 "William James Glackens, Luxembourg Gardens." In Corcoran Gallery of Art: American Paintings to 1945. Edited by Sarah Cash. Washington, 2011: 190-191, 275, repro.